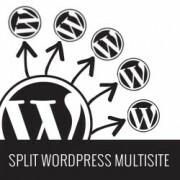 Are you trying to split your WordPress multisite network into individual WordPress websites? Moving a single to its own domain is a challege that a lot of multisite admins come across. While running a multisite network has its own advantages, sometimes a single site may outgrow the network and need its own space. In this article, we will show you how to move a website from WordPress multisite network to its own single install of WordPress. Important: Since you are going to do some serious changes to your site, it is necessary to create a full WordPress backup before you do anything else. 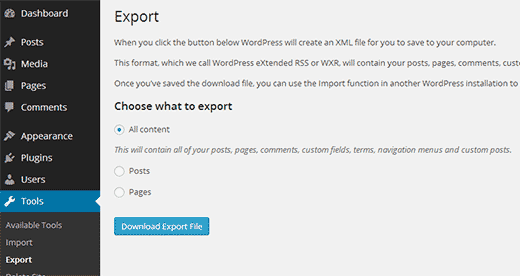 The built-in WordPress import/export functionality works the same way in multisite as it does on a single site install. We will be using the default tools to export the data from a site on WordPress multisite network. First you need to login to the dashboard of the single site you want to move, and then click on Tools » Export. Next, you want to make sure that all content is checked and click on the Download Export File button. WordPress will now create an XML file containing all your data and send it to your browser for download. Save the file in your computer because you will need it in later steps. 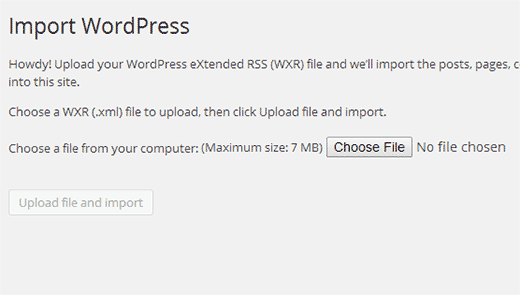 Now that you have exported the files, you will need to set up a separate install of WordPress. Here is our tutorial on how to install WordPress. Once you have installed and setup WordPress, you can move on to importing your child site. Login to the WordPress admin area on the new location where you want to move your child site and then go to Tools » Import. 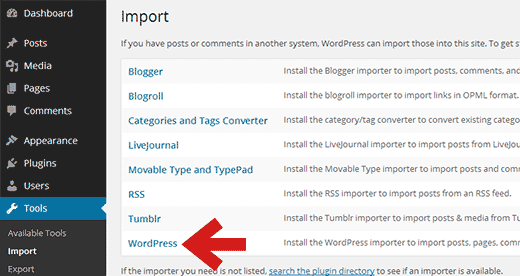 On the import screen, WordPress will show you a number of import options. You need to click on WordPress which will bring up a popup to install WordPress Importer plugin. Simply click on the Install Now button to start the installation. After that, you need to click on Activate Plugin & Run Importer. On the next screen, you will be asked to upload the WordPress export file you downloaded earlier from WordPress multisite in Step 1 of this tutorial. WordPress will now ask if you would like to import users as well. If you do nothing, then WordPress will import all users which is recommended if you do not want to change authors. You will also see Import Attachments option, and you want to make sure it is checked so that WordPress can download images from your posts and pages (Don’t worry if it misses out some or most of your images. You can import them separately afterwards). WordPress will now start importing your content. This will take a few minutes depending on how much content you have. Once it is done, you will see an ‘All done, Have fun’ notification. That’s all. You have successfully imported data from a multisite network child site to an individual WordPress install. There are still a few things left to do. If you were using custom domains for each site in your WordPress multisite network, then you don’t have to setup any redirection. However if you were using subdomains or directory structure in your WordPress multisite, then you need to setup redirection, so that users coming to your old URLs are redirected to your new site. Make sure that your old site on the multisite network and the site on new domain both are using the same permalink structure. For subdomain installs, you need to use this code in the .htaccess file of your WordPress multisite. This code redirects visitors coming to any page on subdomain.example.com to http://www.example.net. The $1 sign at the end of the destination URL ensures that your users land on the same page they requested. For directory based multisite installs, you will need to paste the following code in the .htaccess file of your WordPress multisite. This code simply redirects any users coming on http://www.example.com/childsite/ to http://example.net. The $1 makes sure that your users land on exactly the same page or post they requested. Don’t forget to replace childsite and example.net with the name of your sub-site and its new location. You can also use the Safe Redirect Manager plugin to setup redirection if you don’t like the code method. Moving a site is not a routine task, so it is likely that you will come across some issues. But don’t worry, there is solution for every issue that you may come across. If your WordPress export file is too large, then you can split large XML file into smaller pieces. If your images didn’t import correctly, then you can try importing them as external images. See other common WordPress errors and how to fix them. That’s all, we hope this article helped you move a single site from your WordPress multisite network to it’s own individual WordPress install. Hi, just the blog post I needed. Can I now delete the subdomain where I made the redirection from? Like delete the files and stuff? Works great! Just make sure to add all the plugins first then do the importing. It worked for most of the things.. just had to re-configure few menu points and theme customization. In exporting/importing,however, you may want to do via sql data base, and the plugins should be put one at a time. Overall, it’s quite simple following your instructions. This does seem to answer the question in its simplest form, BUT what about the database, themes, plugins, etc. Your example seems to be continuing to rely somewhat on the muti-site install and just redirecting to a different place. How would I COMPLETELY remove all instances of multi-site and create a stand alone install?? This tutorial is intended to be used when a user wants to move a single site out of their multi-site network. It seems that you want to change your multi-site into a standalone site. This is out of the scope of this tutorial, we will try to cover that in a future tutorial soon. We are not sure what you are trying to do. We are assuming that you want to install a plugin on your main site and want to use its plugins on the subdomain site. We don’t think it is possible. That’s the default behavior for plugins on network. I have multisite installed and in the dashboard I cannot see the “plugin” panel. The only way for me to see and use this panel is to go into Network Admin and network activate plugins. I tried moving to a single site (i don’t want the other one), but I cannot see the plugin panel in the dashboard anymore, although plugins are working!! any ideas? Antonio, if you can’t see the plugins area when logged into your child site, but you can see it within the Network Admin interface, this could be because you have done something to disable them. I know there’s a way to do this in the wp-config.php file. If you know that wasn’t the case, then are you perhaps logging in as a different user with lower permissions, like Admin or Editor? Try UglyRobt’s “Multisite Plugin Manager” plugin. It will let you expose or hide plugins for different sites on your network. With this setup, you don’t have to network enable plugins to see them on subsites. You can pick which sites get which plugin. Yes, it will not export widgets. The export import does not include widgets, correct?